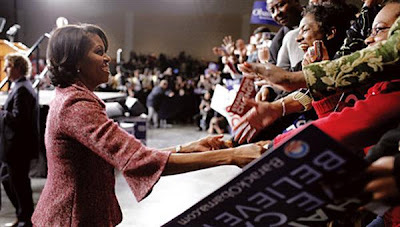 The shameless right-wing attack machine has figured out that it may be more politically expedient to go over after Michelle Obama with subliminal racist attacks than the Democratic candidate himself. And the racist code word of the day is "angry." What they're trying to do is scare Americans into seeing Michelle Obama as nothing more than an angry black woman who they should fear getting into the White House. It's absolutely disgusting. We've heard for months now how the wife of the Democratic Party's presumptive nominee for president, Sen. Barack Obama, is unpatriotic and hates her country. That she is not "proud" to be an American. That she believes America to be a "mean" place. And now she's "angry." Very, very angry. One of the more relentless perpetrators of this reprehensible attack is Sirius Radio's Andrew Wilkow. On his "The Wilkow Majority" show Monday the Sean Hannity wannabe went on a verbal rampage against the "mean-faced," "tough-looking" Obama, saying she was "harboring a whole lot of anger" and that she was "full of rage." So much rage that she has "quivering lips" and a "scowl" when she speaks. And as if that wasn't enough, he railed that "she looks like the kind of woman that would hit her husband with a shoe for talking back." Is this guy for real? If Wilkow would like us to believe that he's not trying very hard to conjure up the racist image of the angry black woman, he is either terribly dumb and naive or thinks we are. Just how does Wilkow know she's "full of rage?" What's he basing this prognosis on? Is he watching the same intelligent, happy family woman that I see plastered all over the TV? I've yet to see even one public display of even a bad mood let alone the sort of "rage" Wilkow refers to. Perhaps it's Wilkow who's the one "full of rage?" Maybe it's Wilkow who "harbors a lot of anger" at the thought of a a black First Family? What's even more outrageous than Wilkow's blatant stereotyping is his claim that his attacks on Michelle Obama "are not personal." The right wing attack dogs have one goal, and that's to scare the crap of America. "Michelle and Barack Obama. The angry radical black man and his angry black wife. A couple of militants whom Whitey should be very, very afraid of." It's 2004 all over again. But instead of gay marriage it's angry black folk. Let's just hope this time Americans care more about the war, the recession, $4.50/gallon gas prices, unemployment, record debt, the housing slump, the mortgage crisis, universal health care and global warming.